When will be My Worst Job next episode air date? Is My Worst Job renewed or cancelled? Where to countdown My Worst Job air dates? Is My Worst Job worth watching? A star-studded cast reminisce about the rite-of-passage of their first ever job. Will Self, Jimmy Carr and Jonathan Ross reminisce about their first ever job. 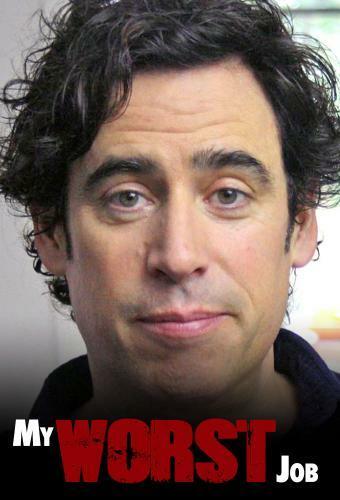 Stephen Mangan talks telesales and Marco Pierre White revisits his time as a kitchen porter in Harrogate. In this episode, celebrities reminisce about their fumbling attempts at career progression - the times they tried to be taken seriously in the workplace as grown-ups worthy of respect. There are also confessions of occupational hazards such as office romance, theft and being fired; as well as dubious bosses, sales spiel and motivational exercises. Jimmy Carr reveals how to market oil. Rufus Hound gives advice on jewellery PR. Grace Dent has tips on teen magazines. Marco Pierre White abandons his Michelin stars for a job as kitchen porter in Harrogate, while Rufus Hound goes back to educating kids at the Science Museum. My Worst Job next episode air date provides TVMaze for you. EpisoDate.com is your TV show guide to Countdown My Worst Job Episode Air Dates and to stay in touch with My Worst Job next episode Air Date and your others favorite TV Shows. Add the shows you like to a "Watchlist" and let the site take it from there.